Transport and the spatial location of population and activities have been important themes of study in engineering, social sciences and urban and regional planning for many decades. However, an integrated approach to the modelling of transport and land use has been rarely made, and common practice has been to model both phenomena independently. 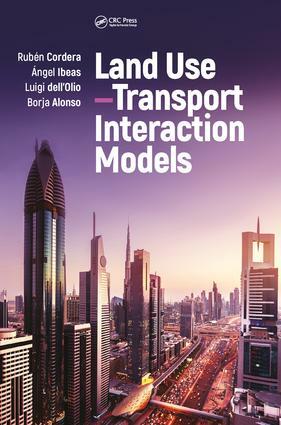 This book presents an introduction to the modelling of land use and transport interaction (LUTI), with a theoretical basis and a presentation of the broad state of the art. It also sets out the steps for building an operational LUTI model to provide a concrete application. The authors bring extensive experience in this cross-disciplinary field, primarily for an academic audience and for professionals seeking a thorough introduction. "It is a book that will be of greatest use to those with some background in the field, or those with a more general quantitative background who seek a guide to what is happening in the world of land use–transport interaction modeling." Dr. Rubén Cordera is a Researcher in Transport and Land Use interaction in the Transportation Systems Research Group at the University of Cantabria, from where he earned his Ph.D. His research focuses on LUTI models, transport planning and spatial econometric models applied to transport and land use. Dr. Ángel Ibeas is a Professor of Transport Planning and director of The Transport Systems Research Group at the University of Cantabria, from where he earned his Ph.D. His research focuses on logistics, transit operation, travel behaviour and intelligent transportation systems. Dr. Luigi dell’Olio is a Professor of Transport Planning and Head of the Transportation Demand Modelling Division of the Transport Systems Research Group at the University of Cantabria. He earned his Ph.D. from the University of Burgos (Spain) and his master of engineering at the Technical University of Bari (Italy). His research focuses on transit operations and planning, travel behaviour and Land Use and Transport Interaction models. Dr. Borja Alonso is an Assistant Professor of Transport Planning at University of Cantabria, from he earned his PhD. He belongs to the Transport Systems Research Group since 2007 and his research focuses on transit operations and planning, transport modelling and traffic engineering.